Big animals have trouble keeping cool in hot climates. The bigger the body mass, the more heat it stores, and elephants are the biggest land mammals on the planet. When they need to maintain their cool, they employ some tried and true methods, but recent research has revealed a secret ability in the elephant's chill-down stratagems. If the wind is blowing, elephants will face into it and extend their ears to benefit from the effects. If there's no wind, they'll flap their ears to create air currents around them that carry away heat from their bodies. If you flap your ears when they're wet, the breeze they create evaporates the water on them and carries off even more heat than when your ears are dry. Elephants bathe when water is abundant and squirt water from their trunks onto their heads and ears if there's not enough to bathe. Spare water, they plaster their ears and bodies with mud, which is cooling, blocks the sun and provides bug bite protection. Pachyderm, which is sometimes used as another word for elephant, is Greek for 'thick skin,' and it certainly describes the elephant. His wrinkled, almost hairless skin is about an inch thick and has to be very tough to hold him together and protect him, but it's relatively useless for cooling because it contains no sweat glands. The only place on the elephant where his skin thins down to 1 to 2 millimeters is on the back of his ears. That's where it works with his circulatory system to become a radiator and help the elephant get rid of excess heat. The back of an elephant's ears are covered with an intricate network of blood vessels. These lie close to the surface, and the thin skin over them allows some of the heat of the blood to dissipate through it, lowering blood temperature by as much as 10 degrees. Both fanning and wetting help this process, but the elephant also has the ability to direct blood flow straight to the ears for cooling. Recent research in the form of thermal photography on zoo elephants reveals, however, that elephants have as many as 15 different areas on their bodies where they can deliberately send blood for cooling. This lets them keep their body temperature normal, which for them is one degree lower than for humans. National Library Board: Ask! : How Thick Is an Elephant's Skin? How Can Large Ears Help Cool an Animal? 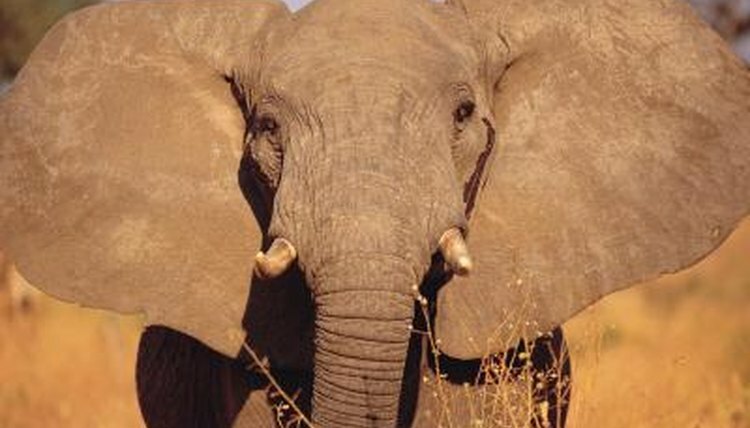 What Animal Has the Biggest Ears in the World? How Far Can an Elephant Smell Water? What Happens if a Guinea Pig Is Shivering? How Do Elephants Get Water During the Dry Season?